Excerpts from my “Journal of Youth,” May to August, 1944. The bad weather persisted and the black clouds were ominous. Our gazogene-powered taxi from the Septier house puttered down the small country road. We saw in the distance the bell tower in the round roof of the Town Hall that was to be our future home. Bursard, a small village located six kilometres from Sées, welcomed us in the silence of the blue-green countryside, shrouded in mist from the Perseigne Forest . 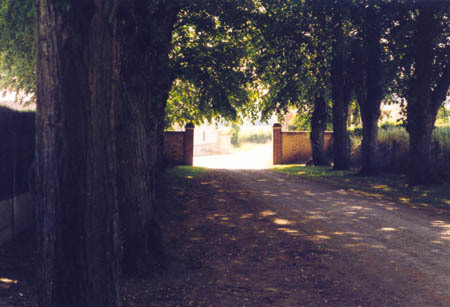 Long rows of well-aligned white fences announced the boundaries of the stud farm, “Haras de Bois Roussel.” where we took refuge in May and June 1940. Our lives could have proceeded peacefully, like a long, quiet-flowing river, while waiting for war to pursue its course, but in the relative calm of our pastoral retreat, an inexplicable unease seemed to develop around us. People had spoken about the establishment of several aerodromes in the areas of Essay, Lonrai and Semallé, several kilometers away from our temporary home. It was rumoured that local residents of these neighbouring villages had been conscripted by the Todt organization to lay the foundations. The construction of such aerodromes by the Luftwaffe could only attract the attention of Allied bombers, who were always on the alert. Ventes-de-Bourse, Mesnil Brout as well as the railway lines at Forges, Vingt Hanaps, Saint Gervais de Perron and others were the daily targets of the RAF and USAF. Each day brought its share of unexpected events and diversions. These were unsettled days. Some days I did not see anything and felt pretty much in the dark about things. What good would there be in maintaining a journal? Only one thing, the bad weather and the formations of planes, passing above the clouds, Allied aircraft pitted against German fighter planes, especially the Focke-Wulfs and Messerschmitts based in the surrounding aerodromes. The American Air Force was active by day and the RAF bombed at night. The incessant noise of the armadas of aircraft passing over our heads at night disturbed our sleep. P47s, with their black and white striped wings, flew over us at very low altitude and we waved handkerchiefs as a sign of friendship. We had the impression that the pilot in his cockpit tilted the wings of his plane so he could see us better and we were filled with enthusiasm when it seemed he had understood our signals. The Allied pilots flew very low…possibly at a height of 50 metres. Curiously, they seemed to have taken the town hall as a point of reference before attacking their prey, in this case the German fighters preparing to take off. June 10, 1944 : We are not alone any more! On this day I had the earphones of our rudimentary crystal radio (which my family made to hear the reports from the BBC) pressed tightly to my ear. Jean Marin, Robert Schuman, and Pierre Dac were our heroes. They were in London , on the other side of the Channel; it made us dream. Suddenly, an alarming movement…the moon-shaped face of a German soldier was pressed against one of the window panes of our classroom. What had brought him so near? The next day, heavy trucks pulling guns, undoubtedly for the DCA, surprised us as we were eating our lunch. The feldwebel had reason to be here; it preceded the encampment of a group of gunners under the lime trees near the town hall. This intrusion into our quiet countryside filled us with concern. The small village of Bursard, in the department of Orne. Isolated to the left, the town hall where will live the Cornevin family. She will cohabit some times with the servers of a battery of Flak. Its cannons will come to camouflage themselves under the limes of the alley of the town hall. Ten trucks, towing guns covered with camouflage netting, lined up in the shade of the tree-lined alley. We realized our peace in this place was over, knowing this unexpected presence was likely to intensify attention from Allied aviation. We confirmed that, if an Allied plane flew low over our heads, any movement on the ground would draw a burst of fire. Recovering from our surprise, we had no alternative than to hide the unwieldy crystal radio set and the compromising photographs highlighting the past military service, in the Air Force, of our cousin who was demobilized in 1940. 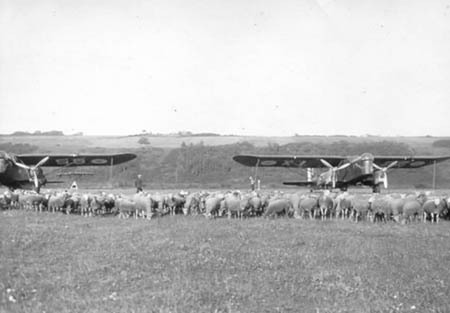 One photograph represented his plane, a Potez, on the ground at Auxerre, lost in the middle of a herd of sheep. Today, there were attacks by Mustangs, planes easy to identify with their square wings. We began to understand the reasons behind the activity around us. Several aerodromes were under construction in the surrounding villages. We learned that five soldiers of the group (who were dispatched to the area around Essay to get the aircraft ready) were killed or mortally wounded. A beautiful morning... relief... without warning, the trucks disappeared from the village dragging in their wake their threatening guns. But they set up only a few hundred meters away, in the green meadows of the stud farm at Bois Roussel, at the spot called "Les Fontaines." Scarcely visible beneath the branches, it was very difficult to make them out from our house, in spite of the fact that the meadows in the south of Bursard were very open, practically without obstruction. The thoroughbreds did not seem to be overly disturbed by the presence of these intruders. 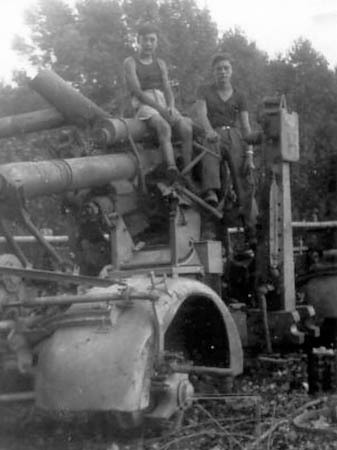 June 13: A fighter crashed on the railway. Aerial combat near Semallé and Neuilly-le-Bisson. Two planes crashed in a spiral. Nationality unknown. In fact, one plane was the P47 of Lieutenant Bentley (originally from Oregon ) whose plane, caught by the blast resulting from the explosion of a rail car, struck the railway line at Vingt Hanaps. The burned body of the pilot remained there for a long time. Mr. Bernard Pottier of Neuilly de Bisson has personal mementos and wishes to return them to the family of Lt. Bentley, or his descendants. A deafening noise in the distance. Heavy clouds skim over the ground. The terrain around Essay became a target. The gunners billeted within our walls identified formations of the four-engined Liberator bomber. May and June 1940 -- We had already taken refuge at the stud farm at Bois Roussel. The French troops had left the premises of the chateau in a lamentable state and had killed the two swans in the pond before their hasty departure towards the South. Germans on motorbikes made up the advance party of the invading army and surprised us one beautiful morning in June, before we had got out of bed. A din of engines under our window made us jump up and look at the impressive spectacle of these menacing-looking motorcyclists, wearing gray raincoats, covered in dust. After a fast inspection of the house, one of them sat at the piano and played war songs. "We had made real efforts to get organized on the ground when an attack took to us by surprise. We threw ourselves to the ground as all hell broke out around us. It was total chaos. An eternity later we were all alive. Following this attack, which practically destroyed the landscape, the II /JG 1 could only abandon this overly-exposed site and redeployed in the pastureland adjacent to the village of Semallé , getting on toward Lonrai. A narrow grass runway, bordered by high trees, was created as were others during the days that followed in the meadows and fields bordering the road connecting Alençon and Essay. Today, a dogfight which resulted in a fire at the farm at Beauvais . It is approximately 1400 hours. In the distance a plane spiralled into the thick foliage of the forest at Perseigne. Report of Mr. Paganet of Cerisé: “On June 22, 1944 , around 1430 overhead the woods of Maléfre (Sainte Peternet,) an aerial duel which resulted in a German aircraft falling in flames into the forest at Perseigne, at a place called "Fourolet" (Ancinnes). June 24: After four days of bad weather... feverish activity among the men at the batteries. They milled about excitedly in our courtyard. Aerial combat overhead between planes of unknown nationality. A fighter crashed near Valframbert -- English nationality, according to some witnesses. I am able to bring in reports on the crystal radio about the execution of Philippe Hanriot. On June 28, 1944 , a fighter crashed near Semallé in the vicinity of the commune of Valframbert. The pilot was buried at this location and the grave has the following inscription: “A British aviator, identity unknown, died on June 28, 1944 . A dogfight with a German plane. Plane No MN818. Note: After investigation, the plane at Semallé could have been a Typhoon MN818 piloted by FO Holmes of the 609th squadron. Note: Bernard Frappé (q.v.) A pilot of a II /JG1 was wounded today, June 28. 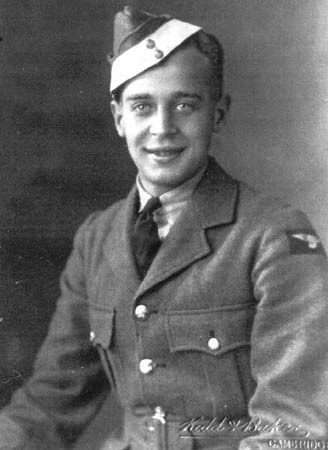 FHJ FW Brunner of the 6 Staffel was taken as a target by two enemy fighters as he drove along the road connecting Essay to Alençon. Another day, the yearlings, which were spooked by the passage of overhead of Thunderbolt bombers flying at low altitude over our heads, galloped past by our hiding place. We stayed flat on our stomachs in the tall grass near a hedge; we did not dare to make a move. One scare after another made us think of the risks that there were in crossing these open spaces while our valiant thoroughbreds were grazing on the tender grass of the meadow. Aerial combat. We heard that a German bomber had crashed into the forest at Perseigne. "On June 23 at 2 in the morning, a German bomber crashed in the forest at Perseigne, a few hundreds meters from the forestry house at Buisson. Mr. Boissier Abel, chief of district at the time, saved a casualty from the burning wreckage, which earned him a diploma of recognition from the occupying army. Five other airmen were incinerated and perished. A sign made out of wood, on which was written “Here there are human ashes,” was placed on top of stones piled one upon the other. This sign later disappeared. Mr. Bossier did that as a gesture of humanity and not of collaboration"
A fight in the distance in the late afternoon. Several planes crashed into the countryside, approximately to the north-west of us. July 16: This Sunday a bomber crashed at "Chouannerie"
Many different noises could be heard in the air. An Allied plane was shot down by the German DCA at Bélandrie near Larré, at a place called "Chouannerie". According to the farmer, all seven men in the crew perished. It appeared that the aircraft was going to drop supplies, weapons and ammunition for the local Maquis. The ammunition continued to explode all night. The same question comes up… What is the nationality of this plane? Without question, Allied. At the request of the mayor of Larré, I was able to identify this plane in 1998, with the assistance of the ANSA. 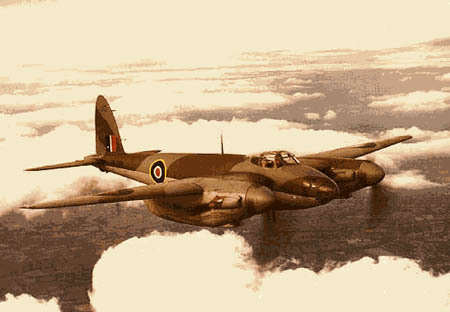 They were searching for a four-engined Halifax plane that was carrying weapons and ammunition. After taking off from Tarrant Rushton airbase, it was to supply the”Goudron” area of Radon, located within the bounds of the forest at Écouves. Six identified victims and an unidentified 7th victim who was found much later in a beet field under a wing flap or aircraft door. This unidentified victim could have been a member of the S.O.E. (Special Operations Executive). 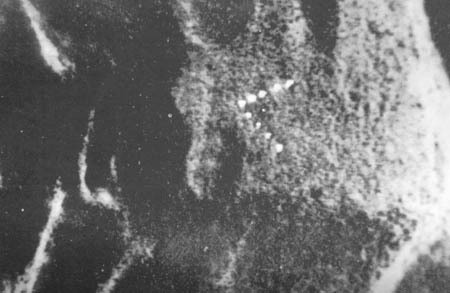 Fires marking the site of a drop zone. The cause of this crash landing was given to me in 1999 following eyewitness testimony by the mayor of Forges. A DCA was set up in the area of Forges, like the many others at Bois Roussel, at the place called ‘Les Fontaines’. The Germans suspected the presence of a parachute drop zone in this area (and in the surrounding areas) so they laid a trap by starting several fires to make it appear like a drop zone for containers of weapons and ammunition. 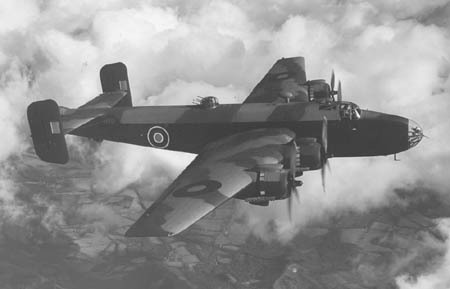 The pilot of Halifax , lured by the presence of these fires, reduced engine speed to go to a lower altitude and prepare for landing. The German flak left no escape route for this plane and shot it down. The names of the members of crew were unknown for a long time. In searching for the families, in 2003 I found Tom and Elsie Linning on a genealogy website. 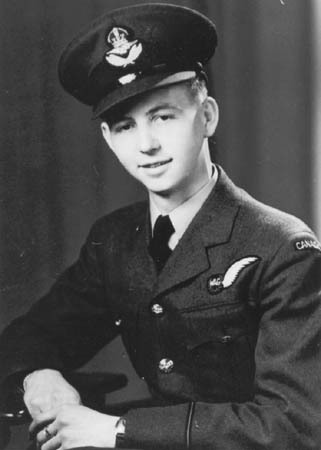 They mailed me the photograph of the one of the members of the crew, William Edward Linning, 24 years of age, Royal Canadian Air Force Squadron, 298 RAF (a close cousin of Tom Linning). William was a flying officer, wireless operator and machine gunner on board the Halifax . 60 years afterwards, they discovered William’s grave and the circumstances of the crash. The body of William Linning (originally from Alberta ) rests today with his Canadian comrades in the Bretteville-sur-Laize Canadian War Cemetery in Calvados. 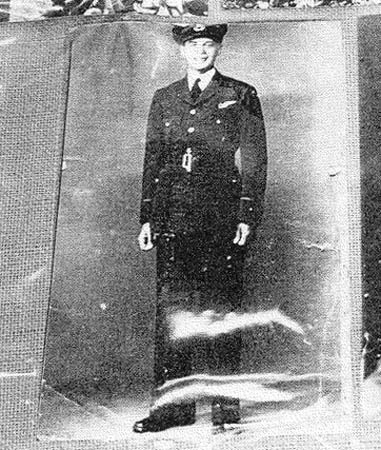 Other members of crew were: P/O James Foxall Crossley (pilot, aged 24 years); Sgt. Edward Maurice Cyril Wilkinson (flight engineer, aged 24 years); WO Joseph Wilfred Romeo Fournier (wireless operator and machine gunner); FO Derwood William Smith (bombardier, aged 22 years); Sgt. Enzo Biaggio Grasso (bombardier, aged 23 years); and an airman who has not been identified. Thereafter, I learned that some ten parachute drop sites had been set up before August 1943 by Edouard Paysant, departmental chief of the BOA (Bureau des opérations aériennes). Edouard Paysant left his residence in Sées following the crash landing, on July 4, 1943 , of a B17 at Belfonds, and after he had organized and facilitated the escape of six members of the crew (see the report "Independence Day" on the ANSA website). 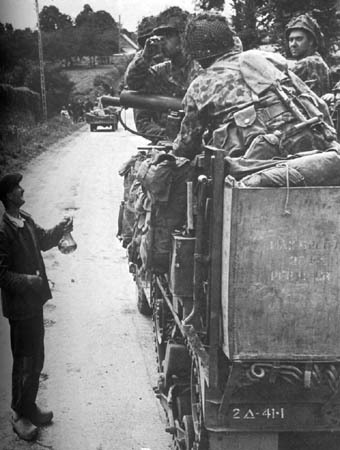 Remember that the land around Montmerrei, Merlerault, and Haras de Rouge Terres not only received tons of ammunition and weapons, but also several secret agents, thus preparing and arming the Resistance in anticipation of the landings on the Normandy beaches on June 6, 1944. Consequences... Many arrests of members of the BOA amongst whom were my neighbor, Albert Frémiot, Place de Parquet in Sées, and our teacher, Jean Mazeline. After imprisonment in Château des Ducs in Alençon, both were shot at L’Hôme-Chamodot (Orne) on August 8, 1944 with two other Resistance members. Within the context of this crash landing, let us remember the arrest and deportation of more than 20 inhabitants of Sées and the surrounding area, including four gendarmes of the local brigade. July 18: Aerial combat. For us it was an ongoing spectacle. The problem was that we never knew which side was the winner. A neighbouring farmer (I never learned his identity), who was a little tipsy and in a state of panic, arrived at our residence. He had just found a machine that he could not identify in the nearby forest. Out of curiosity, we followed him carefully. The least crackling of the dead branches underfoot in the silence of the forest frightened us. No Germans were in sight as the farmer led us along paths, in shade and half-light, toward the place in the woods at Léguernay where he found the machine. A white mass was visible under the branches. At last, to our astonishment, we discovered under cover of the large trees, a parachute partially covering a signaling station. Several tubes are broken, and the glass was scattered on the dead leaves. Our guide attests as follows. "Fearing the device might explode, I hid behind a tree, took a stick and poked at the box attached to the parachute. Result... I saw a completely ruined, unusable radio installation. It was undoubtedly a radio transmitter, intended for use by local resistance workers, but one which could never be used. The following day two men with serious faces and grim mouths loomed out of the darkness as we were eating our evening meal. Their demeanour made us feel uneasy. With carefully-worded questions, they asked whether we knew anything about the parachute drops in the surrounding area. We hesitated ….were they Gestapo or Resistance? This uncertainty brought on by understandable caution, encouraged us to remain mute in the face of such precise questions. The unknown men departed, discomfited and suspicious. With the passing of time, I remain convinced that this ruined, parachuted transmitting set we had found was intended for the Tessier de Tanville group which had taken refuge in Vingt Hanaps. We know today that this group, faced with the threat of an operation [raid] at Tanville, had been obliged for reasons of safety to leave the place. The mayor and an inhabitant indeed had been just shot by Germans. This group, established at Vingt Hanaps, had to move once again because of proximity to the airfields of Lonrai and Semallé. “At Menil Erreux, which was near the various trunk roads and the railway lines, military operations were reduced to a snail’s pace. At the end of July, the Germans built a vast airfield (approximately 150 hectares) in the meadows near "Normanderie”, but the Allies’ control of the skies limited use of this airfield to only 5 or 6 days... "
With his face running with blood, one of the gunners from the DCA battery arrived to receive some first aid. During a recent attack by a P47, while he was manning the battery installed in the place called ‘Les Fontaines’, a shell had hit him in the left ear. One of his colleagues made him a solid bandage. In the distance, rockets rose into the starry summer sky and went down with infinite slowness. 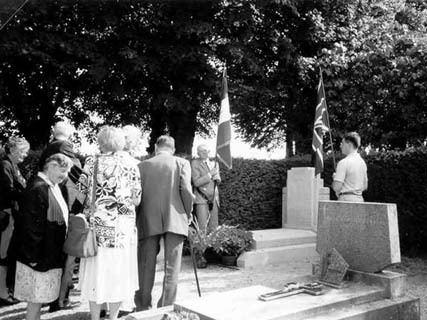 July 30, 1944 : Sombre Sunday! Crash landing of a Mosquito! There were so many stars in the sky! We slept like a log despite the course of the events of the day before. A plane buzzed the roof of our refuge but this time we took the precaution of sleeping in the cellar, hoping for greater safety. A heavy explosion caused the house to vibrate. Awakened suddenly, we did not dare leave our shelter. At dawn, around 6 in the morning, a German gunner we knew pounded on our door and made us understand that a plane had crashed near the road. My curiosity prompted me to follow him and he did not object. A thicket covering one half hectare was blackened by flames and scattered metal pieces of the plane were still smoldering. In front of us, the badly mutilated bodies of the two occupants, the pilot and the navigator, rested in the middle of a mass of branches. With a single word, the German made me understand that the aircraft was a Mosquito night fighter from the RAF, shot down by the local DCA. He drew an identity card from the tunic of the one of the victims and held onto it... could he intend to give it to the Red Cross? Needless to say, this drama saddened us, since we knew that the Allies were making progress on all fronts. The problem was to know how our area will be freed and with what results for all of us. The Germans were not long in appearing. Two days later, after collecting the bodies of the victims, they organized a hasty burial at the edge of our garden, within a few meters of us. In spite of our insistence, they refused to let us be present. A platoon of soldiers was already there at the burial site. A fusillade disturbed the silence of our countryside. The emotion was overwhelming. This hasty ceremony proceeded before our eyes, as we stood in silence. This section refers to Frank Carr, Flying Officer (VOR), aged 24 years, Royal Volunteer Reserve, of Swinton Manchester; and Robert Henry Clark, Flight Lieutenant, aged 24 years, Royal Volunteer Reserve (parents living in Fulham, London), both of the 487th Squadron of Royal New Zealand Air Force. A pale sun breaks through the fog... It is just midday . 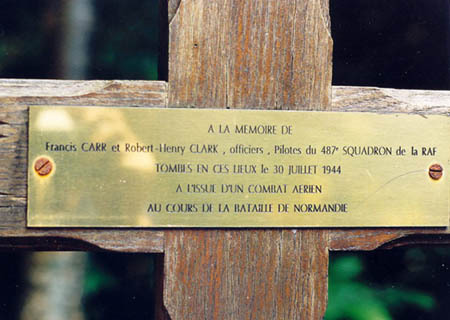 A plain marble gravestone, isolated in a corner of the cemetery (on the left) with this epitaph: "To the glorious memory of Flying Officer Francis Carr, No 148458, October 27, 1919 - July 30, 1944, and Robert Henry Clark, No 487 Squadron RNZAF, February 16, 1920 - July 30 1944, Fallen in an aerial combat, in the woods of la Garenne, Bursard, Orne. 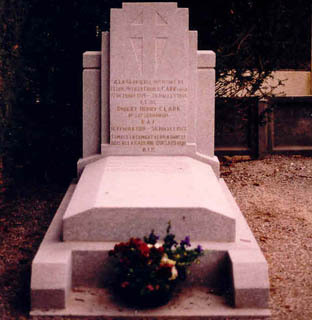 RIP"
Tomb of Frank Carr and Henry Clark, to the bottom of the cemetery of Bursard. Cross situated at the scene of the crash, in the wood of "la Garenne". Commemoration of the fiftieth anniversary in 1994. A distant voice is heard, despite the jamming. It announces the disappearance of Sainte Exupéry in the Mediterranean . For me it is the evocation of "Southern Mail" [Courrier Sud], "Night Flight" [Vol de nuit], "Wind, Sand and Stars" [Terre des hommes], and "The Little Prince" [Le Petit prince]. August 12, 1944 : At last! 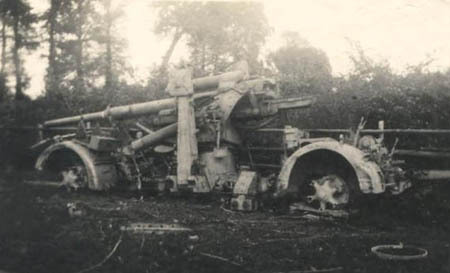 A cannon of Flak sabotaged by the Germans before their precipitate departure. 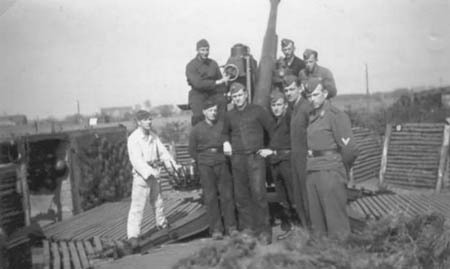 A photo memory of the servers of the Flak battery recovered by Roger Cornevin. The liberators welcomed by the Norman population. In Key West, Florida in 1962 I met an American officer who told me, filled with enthusiasm, that he had taken part with the Patton’s 3rd army in the breakthrough at Avranches, and then in the liberation of the villages surrounding the area of Alençon. Under the heat of an August sun, feeling the effects of many glasses of "apple-brandy", he had not been able to complete his journey. He added, however, “the green hedges of Normandy are something I will never forget ! At the junction of each hedge, there was an ambush !” Did he speak about the enemy or the apple-brandy?